Our Southern Style: Free Your Feet With Vivo Barefoot Shoes! Free Your Feet With Vivo Barefoot Shoes! Disclosure: I received the shoes featured in the picture above to facilitate this post. All opinions are my own. I hate socks and shoes. I always have and I probably always will. Probably one of the reasons I love Summer so much is because I truly get to set my feet free! One of the best sensations in the world is feeling the ground beneath my feet and the air on my toes. I'm sure many of you have heard about the "barefoot" shoe craze. Apparently it's been around for a while but somehow I'm just now discovering it. 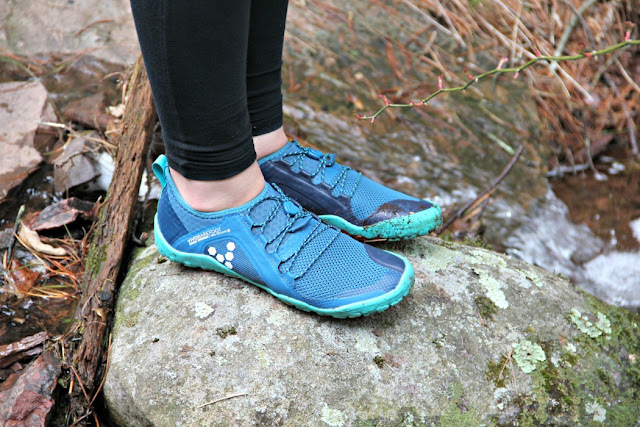 I began to research all of the benefits of going barefoot and decided this was definitely something I had to try Our family loves being outdoors and when I searched for a company that made barefoot shoes for the whole family, Vivo was at the top of the list. Vivo sent shoes made for our littlest (Levi, age 5) all the way up to my and my hubby (age 36 for the both of us) and we set off to our favorite mountain retreat to test them out. Think going barefoot might be for you? Keep reading! What's The Deal With Barefoot Shoes? Did you know that you have over 200,000 nerves in your foot? When you wear traditional sneakers the hard sole prevents your feet from feeling what it needs to feel to tell your brain how your feet should naturally move. Sneakers have a more pointed toe verses a wide toe, reducing stability, particularly where your big toe is concerned. Consequently, this leads to weakened toe muscles and overall poor foot function. All of these issues with traditional sneakers is especially true of kids and their growing feet. Going barefoot one of the best things you can do for the foot health of your family! Trek is a versatile leather and neoprene walking shoe that lets you go barefoot from peaks to the city streets. It is water-resistant and features our Firm Ground sole studded with chevron lugs that provide traction over trails and rocky terrains. The neoprene ankle sock gives a 360 degree foot hug without compromising total freedom and flexibility. Hydrophobic technology together with a removable thermal insole keep your feet warm and comfortable. Trek has you covered through the changing seasons; perfect for every weekend activity from rural rambling to city strolling. My husband was the one I was most concerned about when it came time to go barefoot. He struggles with weak ankle muscles, small arches, and in general, a very wide foot. After years of struggling with his feet, but also constantly wearing shoes, work boots, etc. the switch was a bit tough at first; almost like having sore muscles when you first start exercising after years of slacking off. Ben loved the look and sturdiness of the Trek and he's grown to enjoy wearing them, especially when we are doing outdoor activities. We were just setting off to an afternoon of kayaking last weekend and I heard him shout from the living room, "Honey! I can't find my Vivo's!" I think it's safe to say these are definitely growing on him more and more every time he wears them. Primus Trail FG is a versatile off-road shoe, designed to let you get back to nature with maximum sensory feedback. Our Firm Ground sole features low-profile, chevron lugs that provide traction over trails and rocky terrains. Perfect for exploring any rural or urban habitat. The breathable design uses a no-sew construction to assure seam durability and robust flexibility, letting you head off the beaten track with natural barefoot freedom. Yippee!! If my feet could talk that is exactly how they would describe my Vivo shoes! I'm the girl who wears flip-flops just about all year around, and thinks it feels good to walk out to the mailbox on the hot gravel in the summer (you get the picture - I hate wearing shoes!). My feet were more than ready to accept barefoot shoes. It wasn't long after putting them on that I decided to turn these shoes loose and see what they could really do. As I ran along the trail I felt like a native from hundreds of years ago who had lived on these mountains her entire life, developing feet perfectly adept to conquer the lands. It really was like running barefoot! My toes were able to spread out and I could jump over rocks and other road blocks on the trail without skipping a beat or loosing my footing. My feet sensed every part of the ground beneath me without any pain from sticks, gravel, etc. Any discomfort I felt I discovered was due to the fact that I had pulled the elastic laces too tight. I ran through the mud, I ran through the grass, it was as if my feet experienced true freedom for the first time. These babies are in my life to stay! The OTILLO Primus Trail Swimrun is designed for endurance over land and sea, with a lightweight construction and sock-like ankle fit. It has a quick-draining mesh for minimal water weight and low-profile lugs for off road traction. Vivobarefoot has designed this shoe in collaboration with the original swimrun world championship partners at Ötillö Swimrun. Mariyah is my in-betweener when it comes to the outdoors. Sometimes she loves it, sometimes she could take it or leave it. Ben and I are avid kayakers and bikers, and this weekend, we're taking one of the harder hikes in the Shenandoah Mountain Range. If the mood hits her right or if her friends or aunts and cousins are along for the fun, Mariyah will usually tag along. The SwimRun shoes were the perfect selection for her because she gets the best shoe for the activity, whether we're out on the river or up in the mountains. She loved the grip that these shoes had and the way the shoe really conformed to her feet. I love how the colors really pop! When my kids hear the phrase, "Kids! It's time to get your shoes on!" The shoes they go for first are always their Vivo Barefoot. My oldest, Eva now says her other name brand sneakers hurt her feet. My youngest has never like wearing socks and shoes so the Vivo's have been an answer to all his prayers. Even my middle son, Elijah, who is the most easy going of the bunch loves the feeling of running free and how easy his Vivo's make it to go out and play. The kids and I stayed in the mountains for four days where they played and played in their Primus Kids. I have yet to see any wear and tear on any of the shoes and aside for needing to put some baking soda in Levi's to get the stink out, these have made life as a kid and as a parent much easier, healthier, and way more fun! **Giveaway update** The Giveaway had to be ended sooner than normal due to unforeseen circumstances but a winner has been chosen from those that entered. Disclosure: I received the items pictured above in exchange for facilitating this post. Our Southern Style and Thrifty Nifty Mommy are not responsible for prize fulfillment. One winner will be randomly selected using the Giveaway Tools random selector and notified via email. Once notified, the winner will have 48 hours to respond or a new winner will be chosen. This giveaway is in no way associated with Facebook, Twitter, Instagram, Pinterest or Google. Void where prohibited. Paddington 2 Reminds Us Why We Love This Bear!